How-To DVDs & Videos for Boating, Fishing, & Navigation Products. 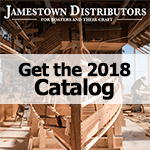 Jamestown Distributors not only offers a full range of boating products but also the videos that explain how best to use them. We have a full selection of videos offering educational and entertaining how-to videos to help develop skills used for Fishing, Sailing, Powerboating, Boat Maintenance, Engine Repair, Fiberglass Repair, Boat Painting, etc. We have videos covering dozens of topics for boating and outdoors enthusiasts.